Get your fix of nostalgia with the Nokia 8110 4G – complete with a sliding protective cover, 2.4-inch curved screen and amazing battery life. Answer the phone by sliding open the curved protective cover, and end calls by sliding it back. 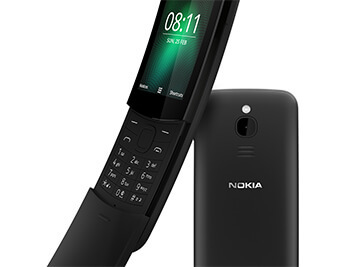 With a 2.4-inch curved screen, polycarbonate shell and 2-megapixel camera, the Nokia 8110 4G puts a modern twist on its iconic retro design. 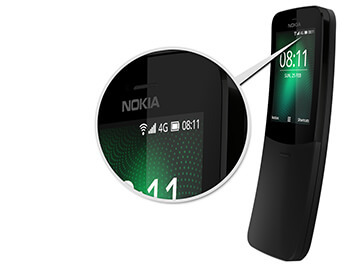 The Nokia 8110 4G is reloaded with 4G LTE capabilities, meaning you can surf, chat and stream faster. The Qualcomm 205 mobile platform brings amazing performance without compromising on battery life, bringing up to 25 days of standby time on a single charge. Explore the KaiOS store for a wide range of apps such as Twitter, and sync your contacts and calendar through Gmail and Outlook. 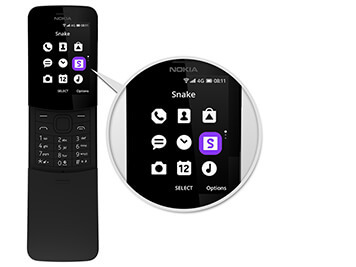 What’s more, the Nokia 8110 4G has the legendary Snake game preloaded, so it’s always going to be time well-serpent.